(CNN) - Bodycam video of a teenage boy's arrest has resulted in another internal investigation of the Mesa, Arizona, Police Department. This comes just days after the department was criticized over surveillance footage showing the violent arrest of a man in a separate incident. Mesa police released videos Thursday showing the arrest of the teenage robbery suspect, who at times screams in pain as officers search him for a gun. The department said in a statement that two officers have been placed on administrative leave after footage of the boy's arrest was reviewed and that there will be an internal investigation. Officers arrested the 15-year-old suspect on May 17, while responding to a call of an armed robbery, according to a statement from the Mesa Police. According to a police report obtained by CNN affiliate KNXV in Phoenix, the suspect, who police said was a Native American, had allegedly threatened a bystander at a Circle K convenience store, pointing what appeared to be a gun at him. The suspect also used the object to smash the windshield of the man's car, the police report said. One witness also told police the teenager said he had a weapon and was going to rob the store. The witness then saw him go inside, take some drinks and leave without paying, according to the report. After police responded, an officer located the suspect and a 16-year-old girl, the report said. Both complied with the officer's commands to lie down on the ground, the report said. The subsequent arrest can be seen in a series of videos the police have released. The footage was taken by several body cameras, showing the arrest at different angles. In the videos, more officers arrived and found the suspects on the ground, complying with the first officer's commands. The suspect hurls a string of expletives at the police, and one officer also uses profanities with the suspect while ordering him to stay on the ground. Officers approach and put the suspect in handcuffs. One of the officers can be seen placing a foot behind the suspect's head while he is on the ground. The officer notes in the police report the boot was there to "keep him from getting up." As police pull the suspect up and take him to a squad car, one officer can be seen in the video grabbing and holding the suspect by what the police report describes as a pressure point behind his ear. The teenager is pushed against the squad car and repeatedly says, "I'm just trying to get home to my grandma." An officer again appears to hold the suspect by the pressure point near his ear while searching for a gun. The teenager begins screaming in apparent pain, continually denying he has a gun. In the report, an officer said he "applied pressure to (the suspect's) mandibular angle pressure point below his left ear" to keep him from moving around. In the footage, officers pull the teenager's handcuffed arms behind his back and toward his head, and he appears to react in pain. Officers found a firearm, described as a rifle with both the stock and the barrel sawed off, in a backpack on a nearby porch, the report said. The suspect was arrested and booked on multiple charges, including armed robbery and aggravated assault with a deadly weapon. CNN is not naming the defendant because he is a juvenile. CNN also was unable to determine if the two officers placed on leave are represented by attorneys. 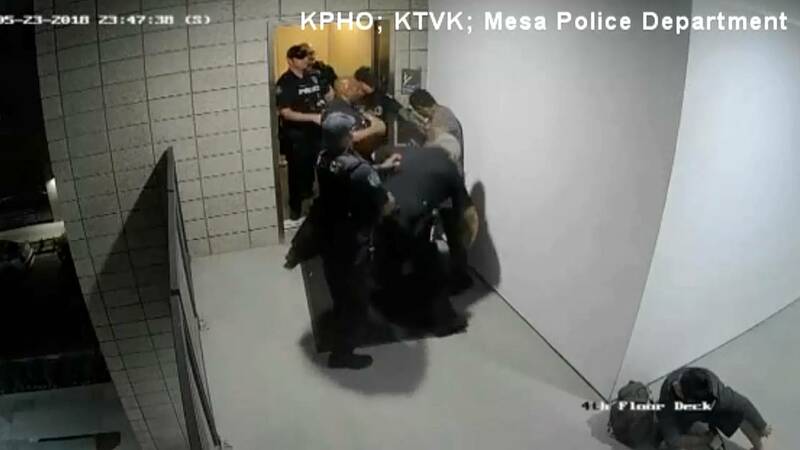 Earlier this week, Mesa police came under scrutiny over its use of force after surveillance footage emerged of officers punching and kneeing an unarmed man in a May 23 arrest. Police said the man, Robert Johnson, 33, resisted arrest and did not comply with commands. But an attorney for Johnson said he did nothing to provoke the officers. Five officers have been placed on leave as a result of this case, according to the Mesa police, and an investigation is underway. Police Chief Ramon Batista said he was "disappointed" by the footage of officers punching and kneeing the man. Johnson told reporters Thursday he wanted officers to "be held accountable for what they have done." In a press conference on Friday, Mesa Police Chief Ramon Batista said he was "angry and deeply disappointed by what I saw in those videos." "It's unacceptable and it needs to stop immediately," he said. As a result of the footage from the separate events, Batista said he asked the Police Executive Research Forum "to conduct a comprehensive and fully independent investigation looking into our use of force events over the past three years, as well as our policies, procedure and training." Batista also asked former Maricopa County Attorney Rick Romley to undertake a separate independent investigation of the department, he said. "It's essential that when this community interacts with our officers, they are treated with the utmost professionalism, no matter the situation," Batista said. "Quite honestly, that's not what I saw in those videos, and that will change."